with only a couple of tweaks, but Pac-Man 256 does exactly that. This endless maze runner is addictive and fun just like its predecessors, but adds some new tricks and strategies that really make it stand out. Our full review has all of the details. Originally a free mobile game with extensive microtransactions, Pac-Man 256 arrives on Xbox One with a low $5 price tag and no microtransactions in sight. The rest of the game still shows its mobile roots in the extremely simple menus, but the gameplay and attractive overall presentation more than make up for it. Pac-Man 256 is an endless version of Pac-Man where you have to work your way up the screen and survive as long as possible before the glitched code pursuing you from the bottom of the screen reaches you. Or you run into an enemy ghost. Whichever comes first. Then you start all over again. 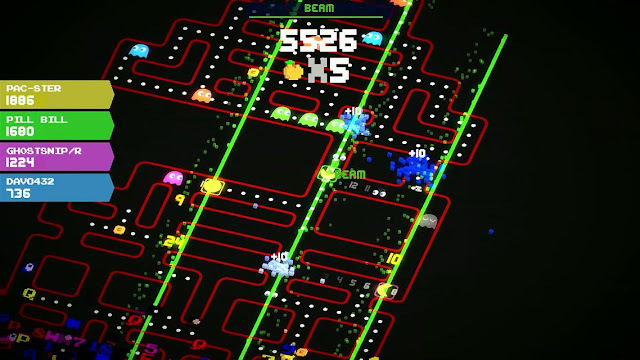 The game plays similarly to the original Pac-Man where you eat dots and fruit and power pellets to turn the ghosts blue so Pac-Man can eat them, but also adds a lot of new twists to the game. All of the different colored ghosts have unique A.I. patterns, so you usually know where they’re going, which makes them easy to avoid. Pac-Man can also pick up a number of power-ups and weapons this time around including fire, tornadoes, lasers, and more that destroy the ghosts just like a power pellet would. Eating 256 dots in a row also sends out a map-clearing blast that kills all of the ghosts around you. 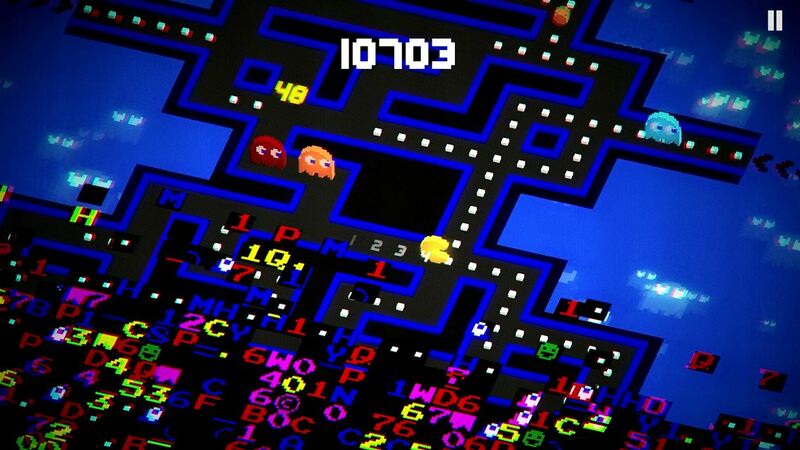 Understanding all of these things is the key to earning high scores in Pac-Man 256. You’re always trying to maintain a dot-eating combo (harder than it sounds), looking out for power-ups, eating fruit to give you a score multiplier, and avoiding ghosts for as long as possible. Every game is different because everything is randomly generated, so it never gets old. You just keep playing and playing and playing trying to get a new high score. You also keep playing in order to unlock new power-ups and earn points to upgrade them. The game has a great system where you unlock new weapons after eating “X” number of dots, but that number gets higher and higher and higher by the end, which makes unlocking everything a long term challenge. You can also upgrade each of the power-ups to last longer and be more effective, and these upgrades require you to spend points you earn by completing missions. Missions include killing ghosts with specific weapons, eating a number of fruits, and other things. The missions and unlock system are totally addictive and, combined with the high-score chasing the game naturally has, make Pac-Man 256 extremely hard to put down. The game only has 10, 100-point achievements, but they’ll take you a while to unlock them all since some are tied to unlocking and upgrading everything. On that note, while I do love how addictive the unlock system makes the game, I do also wish the unlocks came a little faster. The presentation in Pac-Man 256 is wonderful outside of the bare bones menus. The game itself is bright and colorful and immediately recognizable and Pac-Man. There are 10 different visual skins you can choose from as well in order to make the game look different if you want. 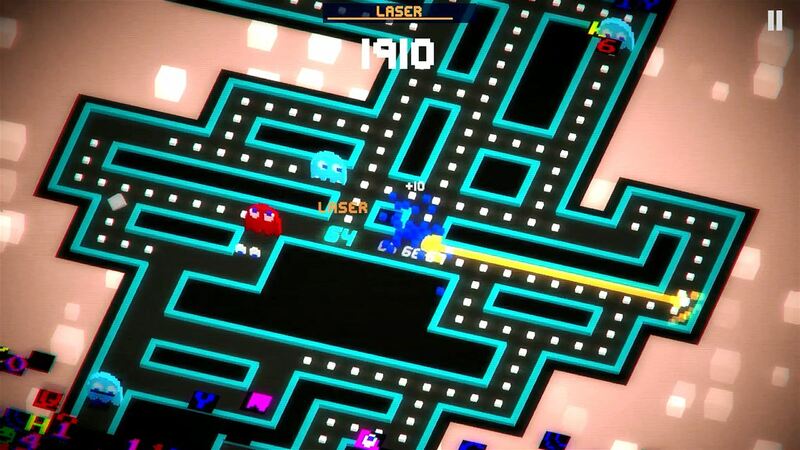 The music and sound effects are pure oldschool Pac-Man, which is awesome. All in all, Pac-Man 256 is an easy game to recommend. The $5 price is absolutely perfect and the addictive unlock system, and great gameplay, of course, will keep you hooked for hours. If you like Pac-Man, oldschool-style arcade games, or just want a new high-score chasing game to kill some time with, Pac-Man 256 is highly recommended.